I went to get the Eggs Benedict. I heard they were so lemony that they warn you before you order them. Whoever told me that was correct. I told them I was ready. We also ordered a side of Corned Beef Hash because we wanted to try it, but didn’t want a whole dish. I love that they offered a side of it. My husband ordered the Waffle special which was a lemon ricotta waffle with fresh raspberries. After much anticipation our food arrived. The bennies were indeed very lemony. I didn’t love it, but I didn’t hate it. What I really didn’t like were the potatoes accompanying the dish. They were not crisp at all, as a matter of fact, kind of slimy. 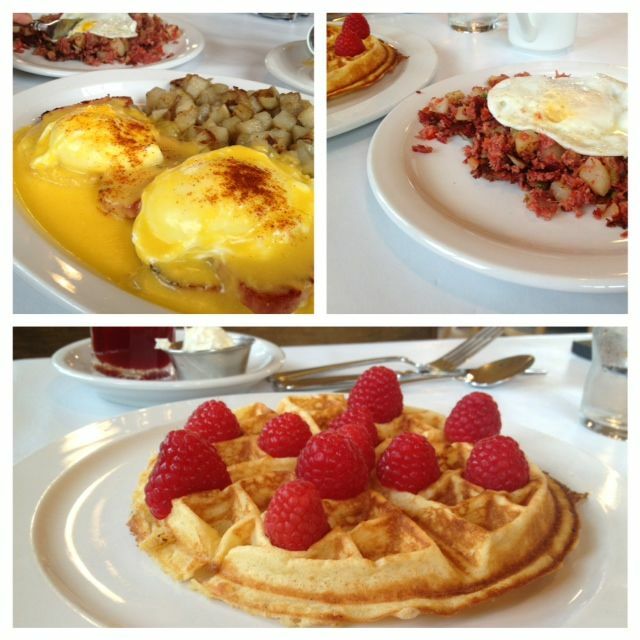 The Corned beef hash was made with the same potatoes and tossed with very shredded corned beef. I have never seen corned beef so shredded before. The hash also had tons of green peppers giving it strong green pepper taste. My husband liked his waffle. It was light and fluffy and had great flavor. I guess my overall experience is I will leave this place to the regulars. Atmosphere is very cute in this older building. Not many tables, a few more were being seated upstairs. Tea was individual loose leaf teas. The coffee was at the door waiting for you to pour your own while you waited for a seat. Service was good. They keep things full and had everything out in a timely manner. Sanborn’s is located at Milwaukie and Powell Blvd.